At the moment, I am only able to drink liquids due to a condition in my oesophagus. Long story short, I am always on the quest to find a dish with a ‘bang for it’s buck’ or, with as much nutrition in it as possible. So I made this for The Chefs dinner, and drained the soup for me. 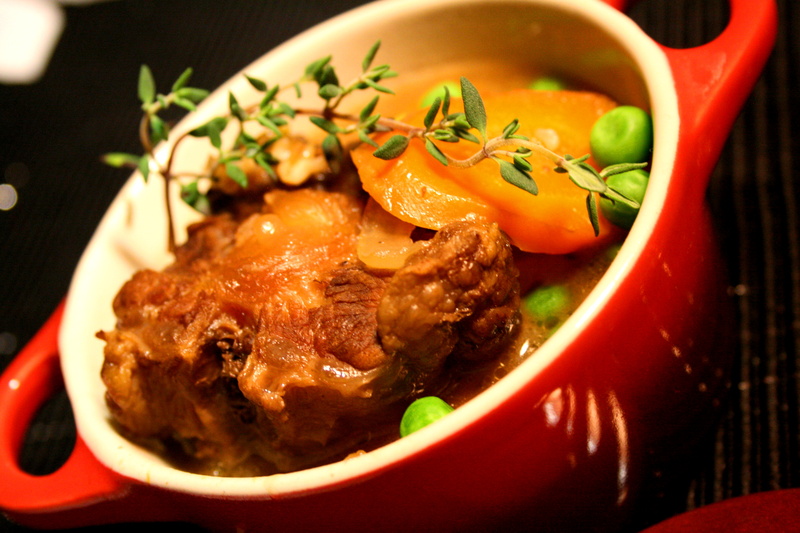 Cooking soups and stews with bones, enables the minerals from within those bones to be leached out into the soup stock. What does mum always say when you are sick?… “You need some chicken soup”. This comes from ancient chinese medicine and their philosophy that drinking chicken soup made from boiling chicken bones, will help you to recover from illness due to its high nutrition content from the bones. Nutritionally, soup made of bones is packed full of minerals and used for centuries for the treatment of various ailments from the common cold to tummy upsets. Making a soup by boiling bones means the minerals such as potassium, magnesium, calcium and phosphorous. The marrow and cartilage contain amino acids and fats that the body can use to prevent inflammation and lubricate joints. The collagen and gelatin from the bones also contains essential amino acids and minerals which can aid digestion, help to build new cells and help to heal wounds. 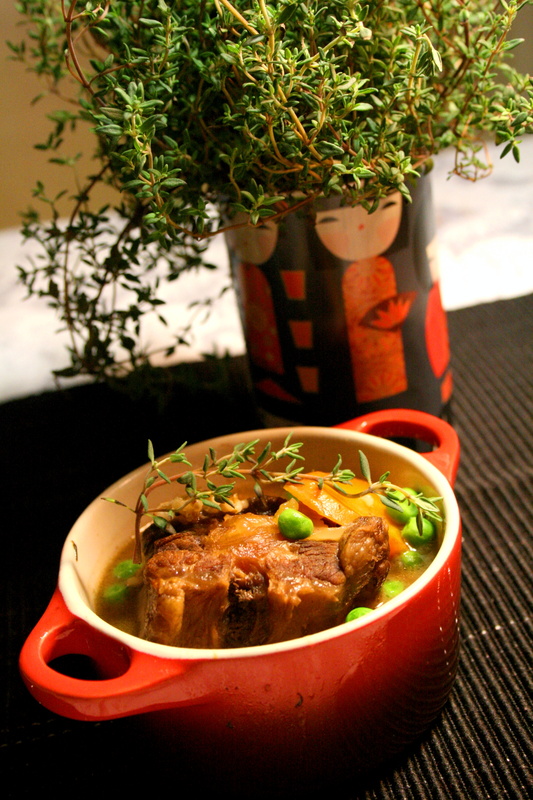 For this recipe I have used ox tail which is an absolute favourite of mine and the chefs, but you could also use beef or lamb bones. Head to your local butcher and ask for these. The good thing as well, is that they are normally super cheap. To this stew I have added barley and split dried green peas for fibre and carbohydrate. You could really add anything you wish to this stew…use this recipe as inspiration to try to develop your own! Place oxtail onto an oiled baking tray, drizzle with olive oil, and roast in the oven for 30 mins on 180 degrees celsius until browned. Remove from oven and pour bones and any juice and oil into a large saucepan. Turn saucepan onto high heat and pour in enough olive oil to coat bottom of pan. Chop onion and garlic finely and throw into the saucepan. Keep stirring to prevent burning. We do want to get a little browning on the bottom of the pan though. Continue to stir. When mixture is browning on the bottom, add approximately 1/2 cup stock to pan and ‘deglaze’. This means use your wooden spoon to stir up all the brown goodness off the bottom of the pan. This will help create the depth of flavour. Add the rest of the stock, ensuring that the bones are completely covered. Take heat back down to a very low simmer, so that bubbles are just slowly breaking the surface. Any higher than this and the meat will be tough. Take a break put your feet up. Cook for approximately 4 hours until meat is falling off the bone. It may be ready before this time, just keep checking. Just before serving, throw in the frozen peas, stir through the stew and cook for approximatley 4 minsEnjoy with sweet potato, baked potato, sourdough bread….you choose! Hi Jillian, could you provide your email address for me?